What could be better than the popular soul food and entertainment hot spot of Hilton Head Island, Ruby Lee’s? Of course, the answer would be another Ruby Lee’s! Ruby Lee’s South offers more of what patrons of the north end location have come to love and expect in the past few years: delicious Southern cooking and a comfortable yet stimulating atmosphere that offers the perfect way to enjoy sports or outstanding blues, jazz and soul from local and regional artists. If you’re not familiar with Ruby Lee’s, it’s a locally owned restaurant, started by Tim Singleton (known to Lowcountry residents as an athlete and Head High School Football Coach). 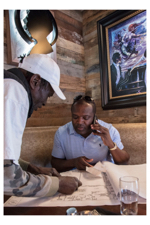 The restaurant is named for Singleton’s late grandmother, who is the inspiration for the Southern-style menu. “Ruby Lee is the matriarch of our family. I always thought of her as my heart with arms and legs,” Singleton said. If you’re fortunate enough to have visited the north end location of Ruby Lee’s, the new Ruby Lee’s South is a bigger, revamped version of the original; yet it still captures the Southern feel-good themes that have an uncanny way of making you hungry for fried chicken, shrimp and grits, corn bread, and sweet tea the moment you walk in the door. 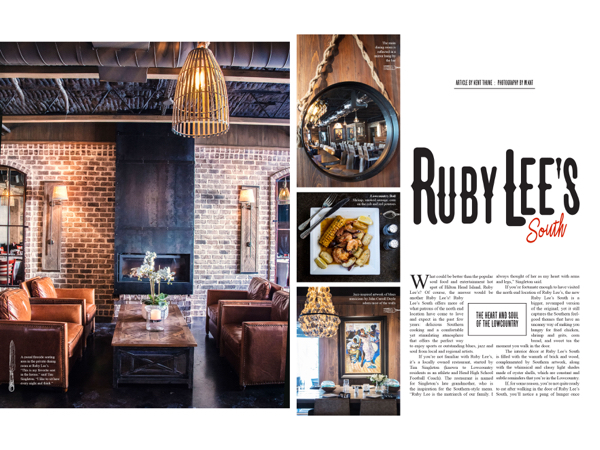 The interior décor at Ruby Lee’s South is filled with the warmth of brick and wood, complemented by Southern artwork, along with the whimsical and classy light shades made of oyster shells, which are constant and subtle reminders that you’re in the Lowcountry. If, for some reason, you’re not quite ready to eat after walking in the door of Ruby Lee’s South, you’ll notice a pang of hunger once you look at the menu. “Our food ideas come from Ruby Lee and from family recipes. 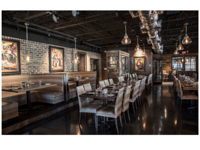 But the whole food experience is completed by the chef and our outstanding staff, without whom Ruby Lee’s would not be what it is today,” Singleton said. And he couldn’t be more right. Employees at Ruby Lee’s South always seem to be smiling, as if they were happy customers themselves, and with a wait-until-you-try-this look on their faces when describing a food item. For appetizers, you might want to start with crab balls, chicken wings or fried okra. Or you might be in the mood for other Southern staples like corn bread, fried green tomatoes, fried chicken livers or a Lowcountry classic like peel-n-eat shrimp. But if you just can’t decide, go with the Ruby Platter for a sampling of several items, all on one big plate. Oh, and don’t forget to try the amazing sauces with every bite! Moving on to the next course, you’ll want to try a cup or bowl of shrimp and okra gumbo or seafood chowder. For salad options, you can try a simple side house salad, a Caesar salad, or go all out with a Ruby salad that is topped with…you guessed it, fried chicken breast and their famous Ruby sauce. 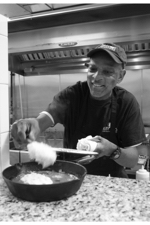 Ruby Lee’s youngest son, Robert Lee Singleton (Uncle Bobby), cooks up an order of Shrimp and Grits. Singleton looks over plans for TimBuk2 at Ruby Lee’s, his cigar bar opening later this month. If you just came to Ruby Lee’s South for the outstanding food, the odds are high that you’ll also end up dancing (even if you didn’t plan on dancing) to the infectious grooves of blues, jazz and soulful musical artists, such as Stee and Ear Candy, Earl Williams, or Deas Guys, who are all so good that you won’t believe they’re from around here. Pamela Graves worked with Singleton to create Ruby Lee’s sophisticated ambiance. If Ruby Lee, the matriarch of a Hilton Head Island family, can bring so much heart and soul to her loved ones with her spirit and wonderful food, then it is Ruby Lee’s South and the original location on the north end that can combine to be the heart and soul of the Lowcountry. The new Ruby Lee’s South is located at 19 Dunnagans Alley, Hilton Head Island. 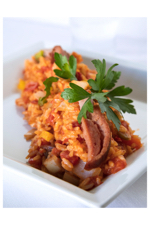 You can make reservations online at rubyleessouth.com or by phone at (843) 785-7825. The other location is on the north end of the island at 46 Old Wild Horse Road. For this location, visit online at rubylees.com or by phone at (843) 681-7829.